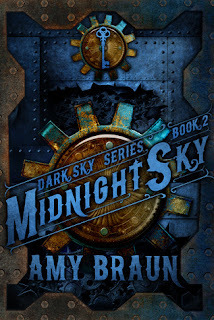 Guys, if I've learned anything over the past few months it's that Amy Braun is a killer writer. Every time she sends me a new book I start it immediately and can't seem to put it down. 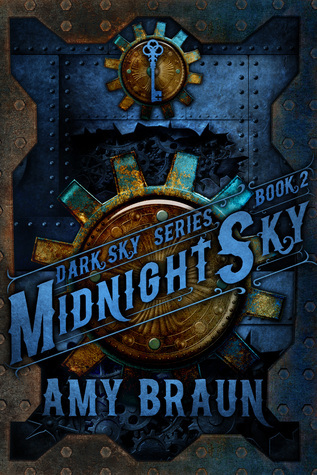 Midnight Sky is no exception to that statement. Braun continues the story of Claire, Sawyer, and their motley crew right where it left off in the first book and I soaked up every last page until I was left with the the biggest cliffhanger yet. I ought to hurt her for it, but I won't because I don't want to do anything that will delay the next book coming out! The book begins with Claire and her crew searching for her parents' journal that describes the device created to open the divide between two worlds, our world and the Hellions'. They attempt to permanently shut the "breach" and close the Hellions out for good. The crew faces many obstacles including other humans as well as the hellions themselves. There are some killer fight scenes, a couple mushy love scenes (not too many), and some intense dramatic build-ups. There is no shortage of action in this book and I always love how Braun incorporates such strong female leads. Go ladies! In summary, Braun has created yet another serious page turner that I would highly recommend to all of my young adult fans out there. It is a quick read and incredibly enjoyable. Now, I guess I'll just sit here and twiddle my thumbs until book 3 comes out in February. *Thank you Amy for sharing your hard work with me! I always enjoy reading your beautifully crafted stories!